Business Description: Taian Saintly Glass Co., Ltd, which is at the foot of world-renowned Mountain Tai, is located in Hi-Tech Industrial Development Zone of Taian. We make great efforts to design、process and sell glass used in characteristic industries, such as electronic glass, lighting glass and automotive glass. We could design、process products and serve customers according to their specific requirements. Our company has more than 120 employees. The main products are as follows: electronic glass, lighting glass, automotive glass and apparatus glass. “high-quality, high-grade” is the main characteristic of our company, and the good quality of our products abstracts a wide range of domestic and foreign customers. We supply electronic glass to LG in Korea, Siemens in German, which are among the world’s top 500 enterprises. Our electronic glass are also widely exported to Europe, America, Australia, Japan, South Korea, Southeast Asia and other countries and regions. 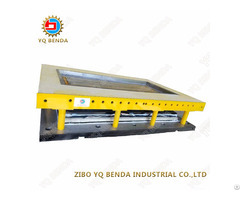 We supply most of the automobile glass to Shandong Lingong Construction Machinery Co., Ltd and Xuzhou Heavy Machinery Co., Ltd, which are key enterprises in China. Now, we are actively negotiating with South Korea's Hyundai (Tai'an) about the cooperation matters. Our lighting and instrument glass are mainly exported to the high-end European market.